2015 Quilt Conference and Quilt Dialogue Coming in April! 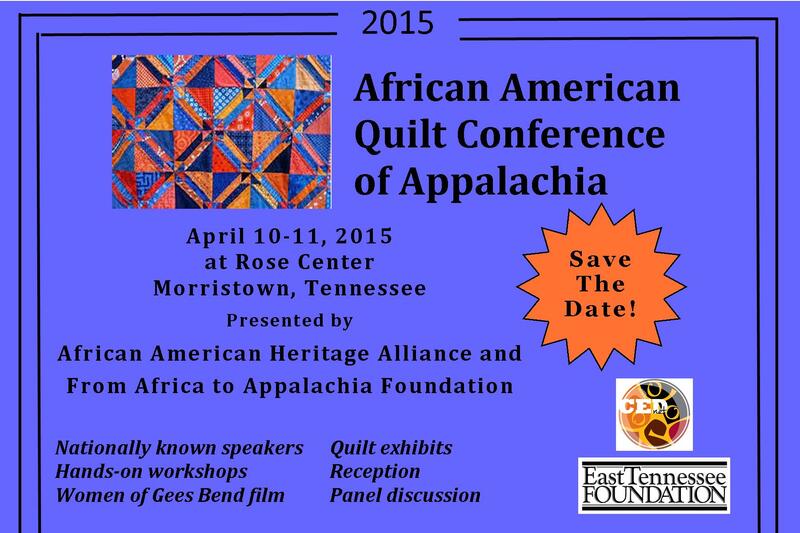 The African American Heritage Alliance and From Africa to Appalachia Foundation are presenting the African American Quilt Conference of Appalachia on April 10 & 11. This event is being held at Rose Center in Morristown, Tennessee and will highlight the cultural significance of quilting and quilt preservation in the African American tradition. Rooted in central Appalachia, this conference will be an opportunity for an active cultural exchange between national quilting experts, historians, artists, and community members to discuss and share ideas about the medium of quilting. Hands-on workshops will be held on Friday and Saturday afternoons from 1-5. Instructors for the workshops are Marquetta Johnson and Aisha Lumumba of Atlanta, and Aundra McCoy of Memphis. See below for information on the workshops. Film: Women of Gees Bend;9 am Saturday following the film Dr. Mazloomi will facilitate a panel discussion with Johnson, Lumumba, and McCoy. Black/White/Colors: A Dialogue about Quilts and Family Stories. Sat, 1 pm. Bring a family quilt and share your story and listen to other family stories about quilts. Running parallel to the conference is a month-long exhibit in the Edith Davis Gallery at Rose Center featuring quilts by the guest panelists and local African American quilters. Exhibit curators are Sammie Nicely and Bob Spirko. If you have any information regarding African American history in East Tennessee please contact us at aahatn@gmail.com.